Soil that is very compressed or densely packed needs help to open up so the grass can effectively extract nutrients from the soil. Water and air also need to be able to penetrate the soil so that roots can grow properly. Lawns can become compacted for a variety of reasons – foot traffic, frequent mowing, improper care and also if there is a heavy clay component. Core aeration is a procedure that pulls plugs of soil leaving small holes that act as breathing space. The word aerate means to “introduce air into”. The soil plugs that are removed from the lawn are adding air and space which frees up the root system and produces ideal growing conditions. In turn your grass will thrive. How Do You Accomplish Core Aeration? For home lawns there is a unique piece of equipment that was created to efficiently pull out plugs of soil (also knowns as cores). Now you can see where the term core aeration comes from. These plugs are about a half inch in diameter and up to four inches long. The equipment will pull plugs about every three inches apart as you run the machine across the lawn. 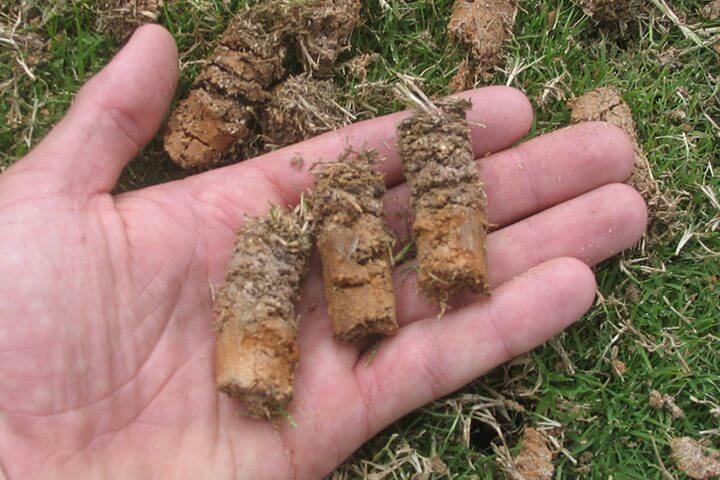 While this may sound destructive, core aeration works small miracles by creating more ideal growing conditions for the soil resulting in a healthier lawn. Don’t worry about the plugs (or cores) left behind in your yard. They will quickly breakdown after a mowing or a rainfall. After a week or so, you will notice that the root system of the grass is filling up the holes which means your lawn is on the way to becoming tougher and more robust. Core aeration pulls all these benefits together so the grass receives more easily all it needs to thrive. The results of a vigorous root system is a beautiful lawn that will make your neighbors the ones who are green with envy. Most Texas landscape contractors will recommend you aerate about once a year. That can shift to more or less frequency depending on the condition of your lawn. The best time of the year to aerate is spring or fall, think March through May or September through November. After core aeration, not only is the lawn “open” for receiving air, water and nutrients, but it also the perfect time to add fertilizer. For an appropriate fertilizing product, check with a local lawn expert on the proper nutritional breakdown you should be using. Depending on the time of year and the health of your lawn, they can recommend the concentration of nitrogen, phosphorus and potassium. Because of the small holes left by the plugs being pulled out, it becomes a terrific time to add lime or iron to the lawn. You can perform a soil test that will tell you the pH balance of your soil and that will determine whether you need lime or iron. That abundance of small holes also creates the perfect environment for over-seeding your lawn. This is a process of adding seed to thicken the lawn growth or to fill in thinning or bare patches of grass. Hopefully now you realize all the advantages of core aeration. It’s an easy process that can be done by a landscape contractor or by renting the aeration equipment from a hardware store. Your lawn will be thankful and you will reap the rewards in no time.